Milwaukee area movers haul donated items to hurricane victims; “We always believe in helping out”. 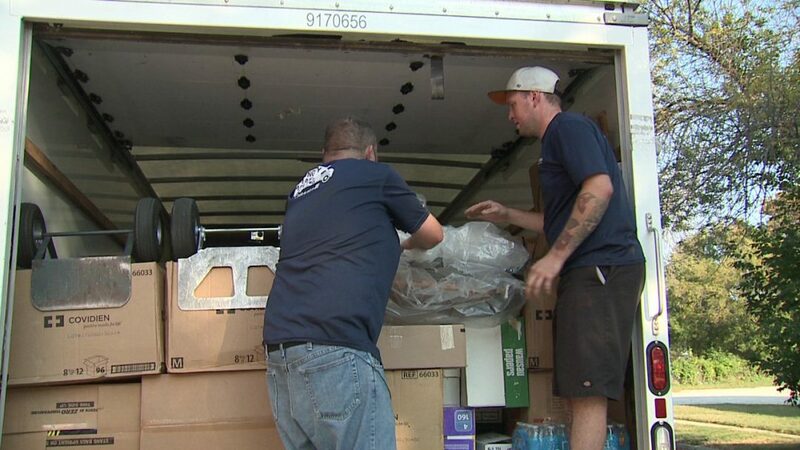 From Texas to Florida, a Milwaukee moving company is covering thousands of miles to help families impacted by hurricanes. From one truck to another, the owners of Hungry Man Moving are preparing one of their rigs for a cross-country trip. The St. Francis-based company is doubling as a delivery service — hauling donated items to Florida. “We try and help out our community and things like that locally, but never to this size and extent. And it feels good to actually help out people who need a lot,” said Amanda Malka, owner of Hungry Man Moving. Malka and her husband, Vernon Snyder are the owners. But the entire staff was pitching in on Saturday, September 23rd. “We only wanted to do one trip at first and then it turned into, we got so much, we’ve got to keep taking it down there,” said Nathan Suggs. The movers have already been to Texas twice — dropping off supplies to victims of Hurricane Harvey. “A community can be as close as just your neighbor or it can be or it can be a neighbor all the way across the country. When somebody is in need you just have to do what you have to do,” Snyder said. The team spent the morning collecting gift bags. “These bags are from HOPE FAITH AND LOVE supporting children in crisis in Racine and there are just all kinds of goodies in there for little kids.” Malka said. The cargo also includes a lot of water. “They definitely do need help and they need the support out there and they definitely need water. I can’t imagine, every morning I wake up and brush my teeth and take a shower,” Snyder said. With the payload strapped in, Snyder hit the road at 8:00 p.m. Saturday. “At Hungry Man Moving, we always believe in helping out anybody,” Snyder said.